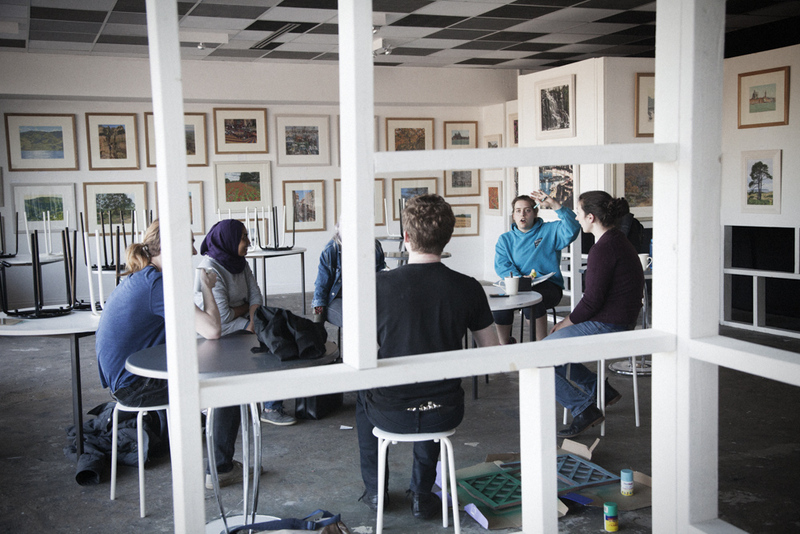 The top floor is taken over by a pop-up cinema, artists’ studios and an exhibition space, and is where Harriet is convening a weekly meeting of Dewsbury artists. She hasn’t wasted any time. 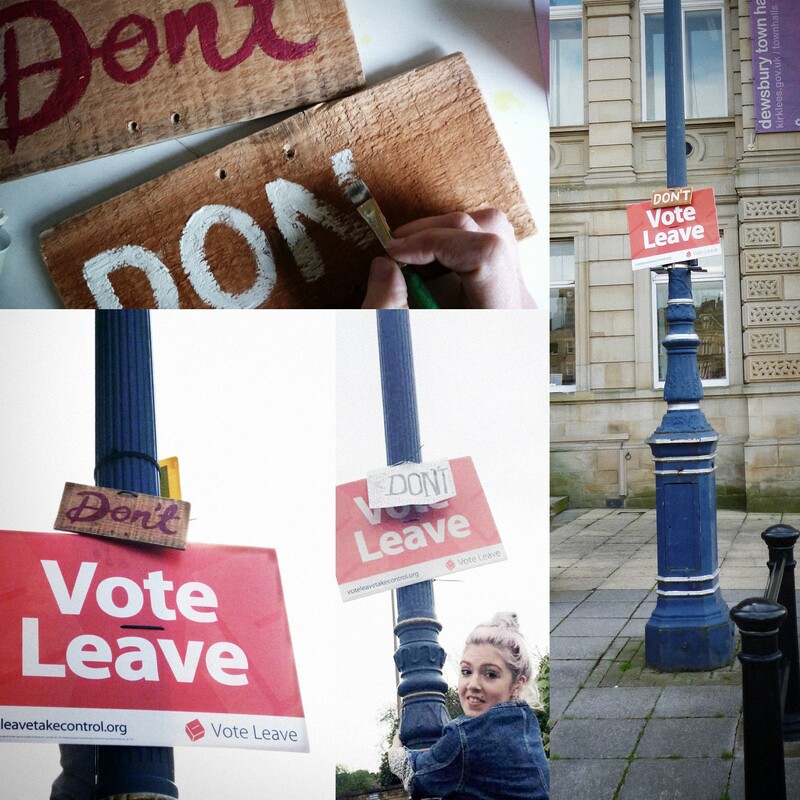 Supported by Creative Scene she’s set up a North Kirklees version of the worldwide phenomenon that is Free Art Friday. Each week, from Ontario to Sydney, free artworks are left in public spaces for people to stumble upon and take home. “It’s a way of getting art into the community,” says sculptor Salma as I unpack my notebook and tape recorder. “…out of the galleries…” confirms illustrator and writer, John. 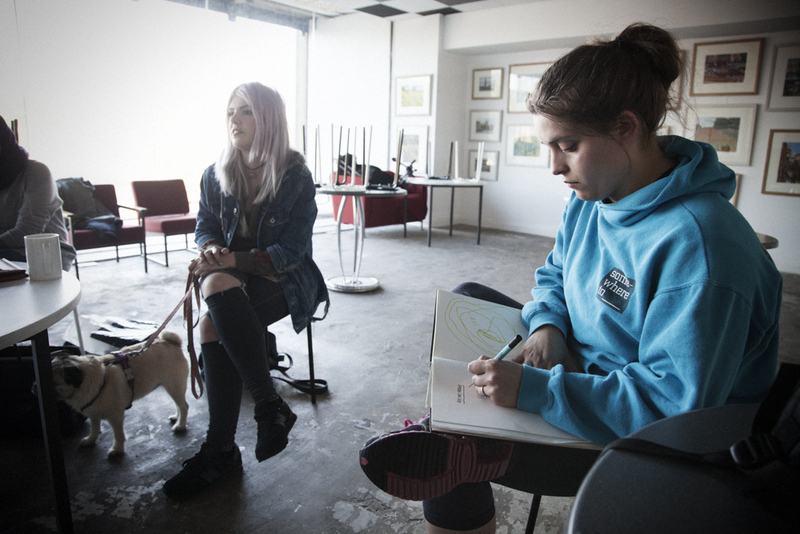 “Would anyone like a cuppa?” asks Ruth as artist Nicola arrives with her dog, Pepper. Each Monday night for the last few weeks Harriet and other socially-minded artists have gathered to agree the week’s Free Art Friday theme. “Great idea,” I say as Pepper snaps at me for no apparent reason. With Ruth and John, Harriet is attending The Northern Faculty, a six-month professional development programme for emerging North West artists passionate about developing a social arts practice. It’s a joint effort between Creative Scene and neighbouring Creative People and Places projects. “Absolutely. We get to collaborate and be inspired by others on The Faculty. Only last week I helped a St Helen’s artist with a project outside The Saints’ rugby ground. We put out a table near the family turnstiles and taught children how to make banners. It was really successful. Back on the top floor: “And what’s the theme for this week?” I ask, with one eye on the dog. Harriet’s got a big idea but isn’t sure everyone will agree. Enthusiastic discussion follows about the style, materials, fixings and briefly, the legality of it all. “We’ll need a ladder,” someone says. “I’m really excited about this,” says Harriet.